Jamie Dimon wants it all. Before I quote him and try to read between the lines, people should realize that Dimon wants higher interest rates to benefit JP Morgan, but not too high. Rising rates help real estate lending. How confusing can you get? He hopes rates will rise. But then he says if the real economy does recover, and fewer treasuries are to be bought, then the result will not be smooth sailing! Will Rogers was right! Bankers don't know their business, meaning there is no certainty in their business. It is difficult for Dimon to have his cake and eat it too. But risk has mostly been transferred to counterparties and to clearinghouses through Greenpan's structured finance. Dimon could be getting giddy with how safe it is for him. Let the counterparties fail, he can handle it. They put up more bonds or too bad for them! His counterparties will surely thrash around if 10 year yields explode. Dimon knows this. That is, of course, why I think the Fed knows 10 year yields can't be permitted to explode. And the economy can't be permitted to recover properly. And Dimon's dream for bigger spreads in his lending to main street is just that, a dream, with a little improvement on the edges, but not the profits he longs for from the housing bubble past. Counterparties are even more weakened than commercial banks were in the Great Depression, and proof of that is the inability to raise rates .25 percent without Wall Street having a nightmare. Dimon mentions in his letter to shareholders that asset values cannot be permitted to plunge. That decline would severely hurt banks, and rising asset values, like oil and easy money housing, are difficult to control. If they cannot be controlled, oil acts as a tax potentially leading to recession, and housing becomes the depository of too much equity, too much cash, meaning when it is liquidated by the Fed, it creates a credit crisis and declining GDP. 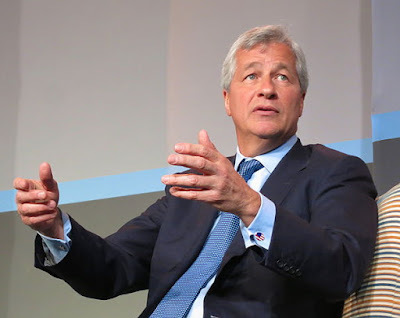 So, Dimon is a bit between a rock and a hard place, wanting to avoid asset decline without overheating an economy that cannot be allowed to recover. Wow, he is starting to sound like Janet Yellen. Jamie Dimon is Janet Yellen. Who could have believed it? It seems to me that real helicopter money would be easier to control than easy money mortgages if we are to believe Eric Lonergan. And it is a more equitable distribution of Fed base money. Why can't we go that direction?